Lush orchards, peachy skies, dramatic mountains, and aromatic blossoms – ShivAdya Resort & Spa is a romantic expanse of the rich Himachal heritage. Handcrafted with wood and layered with eco-friendly concepts, ShivAdya makes for an experience that is quintessentially Himalayan. The property prides itself on spanning across elegant rooms designed amidst surroundings that are warm in the daylight and turn sensuous in the twilight. The property, decked up in both traditional and contemporary interiors, embodies a feel of all seasons for the travel enthusiasts. 3 Nights Luxury Room - 24 sq.m. ShivAdya stands untouched from the rough city buzz amidst spellbinding landscapes, lingering scents and an overall Zen-like ambience. There are a host of activities such as indoor games, skiing, camping and more in and around the property. Spacious and bright, the resort is a must-visit for all travellers at heart. 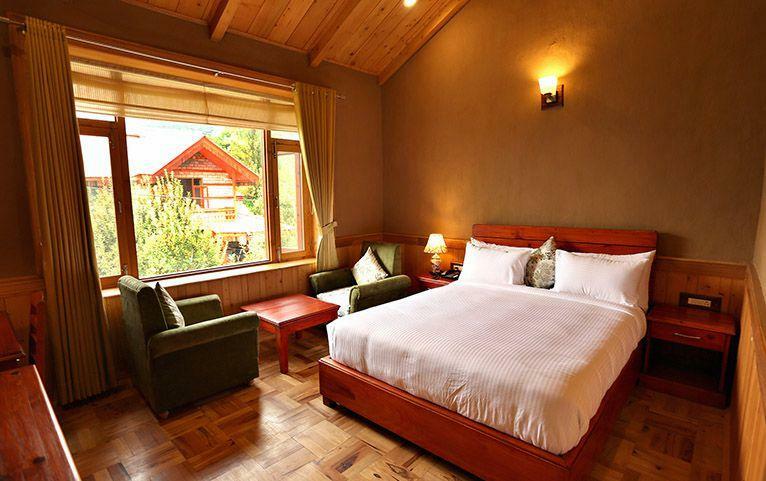 Manali is nothing less than a nature’s paradise for all discerning travellers. With its spectacular panoramas, pristine valleys and mysterious woods, the enchanting hill station epitomises bliss and is sure to make your heart sing. ShivAdya Resort & Spa spreads across 15 rooms built in mud, stone and wood. It draws its inspiration from the hilly culture and blends it with modern amenities. With its surroundings immersed in serenity and style, the magnificent abode takes care of all your vacation moods. Luxury Room - 24 sq.m: The room stands as a bearer of all-thing-luxury with its utterly comprehensive amenities. While a balcony lets in abundant natural light and surreal views, conveniences such as sitting areas and fridges heighten the relaxing effect. Overlooking the gardens and smelling of tranquility, the room redefines an ideal staycation for its guests. Maximum Guest Capacity: The maximum room capacity is two adults and one child aged below 12 years or three adults. See the ‘Extra Guest Policy’ and ‘Child Policy’ for more details. Extra Guest Policy: Where applicable, an extra adult can stay at a surcharge of INR 2,095, which includes extra bedding and the inclusions available in the package, payable directly to the resort. The surcharge would be INR 2,893, should the stay dates be in the following range: 15.04.19 - 09.07.19 and 20.12.19 - 01.01.20. Child Policy: A child aged between 0-5 years may stay free of charge. Where applicable, a child aged between 6-12 years may stay at a surcharge of INR 1,436 per night, which includes existing bedding and the inclusions available in the package, payable directly to the resort. The surcharge would be INR 2,095, should the stay dates be in the following range: 15.04.19 - 09.07.19 and 20.12.19 - 01.01.20. Upon check-in, guests are required to show valid photo IDs including those of the children. Library: Begin new travel friendships one book at a time at the Library. Spa: Pamper yourself with exclusive individual and couple spa options. Restaurant: Treat your taste-buds to a variety of sumptuous spreads for wholesome goodness at the restaurant. Recreational: Indulge in a game or two, or watch your favorite show on flat screen tv at the comfort of your abode. Free Parking: Enjoy access to a free parking facility at the accommodation. Free WiFi: Go online and share your favorite memories with pals via Free WiFi facility. The nearest airport is Bhuntar, around 50 km from Manali and has flight services from Delhi and Chandigarh. The best and most cost effective way to reach Manali is by road. Roads connect Manali to various cities with a scenic drive, including Delhi (540km), Chandigarh (305km), Dehradun (227km) and Ambala (370km). There are several private buses as well that connect the hill station with different parts of the state. Due to its mountainous terrain, there is no railway station in Manali. The nearest major railway station is located in Jogindernagar (163 km from Manali).